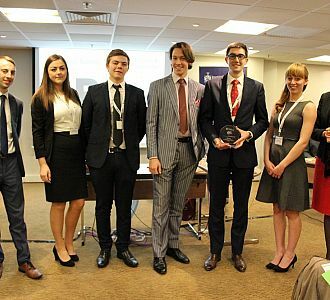 Bournemouth University have won the Passion 4 Hospitality Business Game for the second year in a row. Team member Ellen McCausland tweeted after the event “@HOTS_Simulation Such a fantastic day yesterday at @IoH_Online Conference. Proud to have brought home the trophy for a second year! #BUproud”. The competition was contested this year by teams from Plymouth, Manchester Metropolitan, University College Birmingham, Westminster Kingsway and Bournemouth. These five teams came through the online heats for the competition, which featured eight teams. The simulation scenario was created to compliment the theme from the P4H live debate final. The teams were tasked with creating a revenue management strategy for their hotels and then executing this within the simulation. The teams were judged on their hotel performance results, which included RevPAR, ADR, Occupancy and Gross Operating Profit. They each also had to produce a written revenue management plan. The teams could sell rooms through online channels, set their rate strategies and also manage their social media profiles. The properties all started the same, with all teams having an equal chance for success. The competition was fierce with Plymouth coming a very close second, followed by Manchester Metropolitan in third. The Business Management Game was delivered by the teams from HOTS and arena4finance and in partnership with the Institute of Hospitality and CHME. The winning team will be awarded a day in industry from a partner organisation who will give them experience of what it is like working in the hospitality industry. This will be discussed with the team to make sure the day is focused on an area of interest to them. All of the teams did exceptionally well. If these were real life hotels, all of the shareholders would be very pleased, as all five hotels were starting to turn a good profit by the end of the year, with the chance for further improvement in future years. This was the second year that this Business Management Game has taken place and due to the positive feedback received, it will certainly be taking place again next year. If your university is interested in taking part, contact the teams from HOTS or arena4finance.